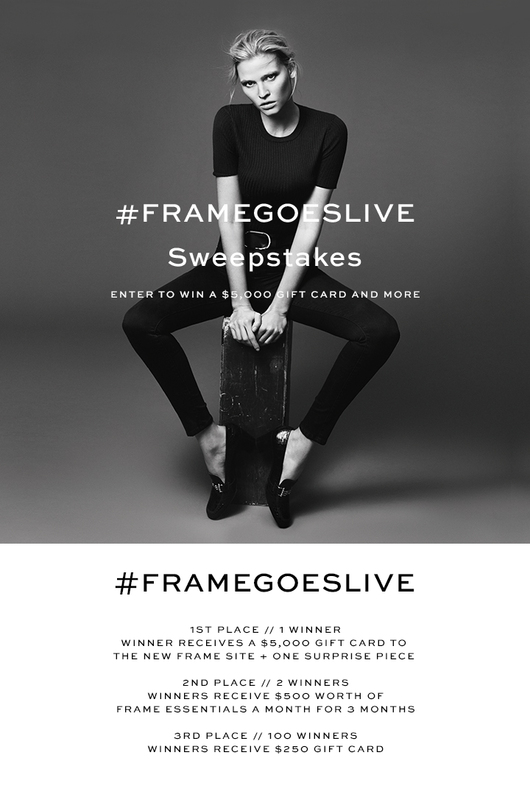 Frame Denim, inspired by London and handcrafted in Los Angeles is celebrating the launch of their new store by offering you a chance to enter once to win a $5000 gift card, Frame essentials & more! 1st Place (1 Winner) – A $5,000 electronic gift card valid on www.frame-store.com and one (1) surprise FRAME product valued at no more than $750. 2nd Place (2 Winners) – For three (3) months, a selection of FRAME products delivered every month. Valued at $500 per month for each winner. 3rd Place (100 Winners) – A $250 electronic gift card valid on www.frame-store.com for each winner. This Sweepstakes ends on 05/25/16 and you can ENTER ONCE to win.